E-signature or electronic signature refers to the electronic data associated with other electronic data used by an individual or entity to sign electronically. These signatures have same legal standing as handwritten signatures if adheres to the regulations regarding it. The global e-signature market size is expected to reach to USD 12.1 billion by 2024, witnessing a CAGR of 32.3% during the forecast period. Different types of electronic signatures such as Signature Pad at POS, Voice Signature, Username & Pin among others contribute majorly to the e-signature market, globally. The e-signature market size has witnessed enormous growth for these solutions over the last few years due to the increasing online transaction in the banking and finance industry and increasing need for security and efficiency in documentation and operations. With the shifting banking and finance processes to mobile devices, these organizations need to provide consumer with an efficient way for documentation and their verification. On the basis of type, the e-signature market is categorized into public key infrastructure, clickwrap, signature pad at POS, voice signature, username & pin, and others. Of all types, public key infrastructure segment holds the largest share in the market as it involves the management of public key encryption. Public key infrastructure facilitates the secure and encrypted transfer of information for different activities ranging from online banking transactions to e-commerce. The technology provides authentic communication and among different individuals or parties validating their identity. Based on user case, the market is segmented into unmediated, third party, mediated, and internal user case. The unmediated e-signature market size was the largest among all user case. The segment is also anticipated to grow at the fastest CAGR during the forecast period as unmediated user case are more user-friendly and faster to complete. On the basis of deployment type, the e-signature market is segmented into cloud-based and on-premise. Of both, cloud-based category holds the largest share in the e-signature market globally. The category is also predicted to exhibit a higher CAGR of 36% during the forecast period as it offers faster and easier workflow without any hardware burden. The key factors boosting the e-signature market growth include increasing awareness regarding secure and controlled workflow, improved user experience and improved operational efficiency. Also, with the increasing identity thefts and online frauds, different organizations and entities operating online are compelled to use electronic signature solutions to retain and improve end to end customer relationships and provide a safer mode of daily transactions and communication. E-signature provide faster and secure validation of documents and communications by ensuring the identification of individuals. Also, different governments worldwide are promoting digitalization of their organizations to ensure transparency and efficient workflow. To achieve they formulate legislation to ensure safer transactions and communication among its organizations and public. This exhibit increased demand for e-signature solutions in these countries. The key challenges faced by the e-signature industry are adherence to the traditional business practices and lack of awareness regarding the legality of e-signatures. In addition, lack of robust policies regarding recognition of e-signature across different countries and the challenges faced for the implementation of e-signature solutions are hindering the growth of the market, globally. Geographically, North America is the largest e-signature market due to the increased level of internet penetration and adoption of online business practices. U.S.is the largest market among all the North American countries and is also predicted to witness significant growth during the forecast period. 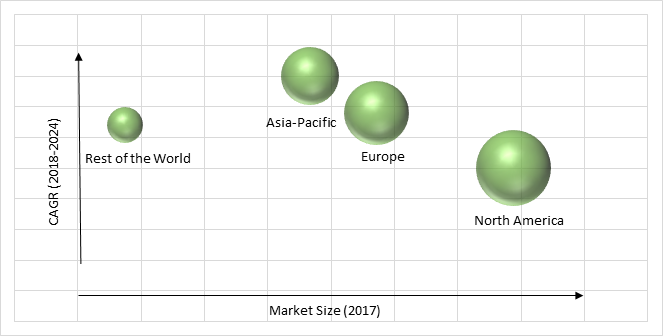 Although still unexplored, the Asia-Pacific e-signature market will witness the highest growth among all the regions during the forecast period. The region provides immense opportunities for industry players as the region is witnessing boom in e-commerce industries especially in the developing nations like India and China. The Asia-Pacific market is expected to witness a growth of around 36% CAGR during the forecast period. Market players in the e-signature industry are partnering or collaborating with other players and are also looking for acquisition of new technology players to retain their market share by providing solutions related to documentation and workflow. In July 2018, DocuSign, Inc. signed a definitive agreement to acquire SpringCM, a cloud-based document generation and contract lifecycle management software company based in Chicago. The company reported that with the addition of SpringCM's capabilities in document generation, redlining, advanced document management, and end-to-end agreement workflow the deal further accelerates DocuSign's broadening of its solution beyond e-signature to the rest of the agreement process—from preparing to signing, acting-on, and managing agreements. Adobe Systems Inc., Citrix Systems Inc., SIGNiX Inc., Docusign Inc., SSL Europa France SAS, Gemalto NV, Sertifi Inc. RPost and AssureSign LLC are some of the key players offering solutions and services for E-Signature. Table 134 Snapshot – Adobe Systems Inc.
Table 137 Snapshot – Docusign Inc.
Table 140 Snapshot – Sertifi Inc.